Tibet is in commotion, people’s life in danger. Looting and shooting and destroying have been on street. The situation there climbed to the front pages of many foreign papers. But when I walked in, through the massive gate of Great Firewall of China to the domestic blogshpere, I found the turmoil and gory images largely gone, a wind of peace, richness and harmony greeting me. It is supposed to be brought by the re-election of the country’s president and premier, and the big finish of People’s congress. I came to the Bokee.com, which calls itself the “No.1 global Chinese BSP (blog service provider)”. There featured movie stars’ and beauty’s pictures, seven-colored front page, but nothing related to what’s happening in Tibet, except a tiny link “Tibet” under the headline “traveling”. No sooner had I clicked the link than I shut it down, as my hope to understand the present Tibet can by no means be satisfied by the alluring pictures of Tibetans’ smiling faces and the spectacular Potala Palace, with a tag reads “welcome here for holidays”. Then I came to BlogChina, another BSP with mass traffic. The headline is inspiring, which is a quote from a blogger named Wu Zuolai —- applaud for President Hu’s insistence on democracy and law (not a bit about Tibet). The Congress (National People’s Congress) of victory, solidarity and glory is now going, plus the great achievement of the 30-year “reform and open”; Recently Tibet has been in insurgence. Wonderful state clashes with the insurgence, thus one of them must be an illusion. A campaign of internet control might have been launched to grasp the fort for propaganda. But different from in history, this time the authority tried to guide the public opinion, so that talks on Tibet were allowed in some way. In several other websites, the public opinion is partially shown. Let’s turn to Sohu’s blog website and yculblog.com, where half Tibet-related articles were copies of official news already released that condemned the unrest, and the others unanimous voices against the traitors. It might be a result of censorship, but one point undeniable is that the incident this time triggered a sense of crisis and furthermore patriotism among many Chinese. 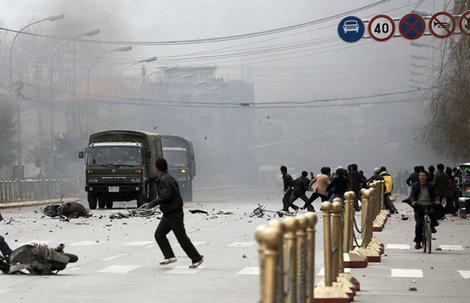 The incident in Tibet is well-organized and planned. The western media see nothing about those thugs with knives in hand who killed innocent people, but tried to confused people by saying that our government is cracking down “peace demonstration”. 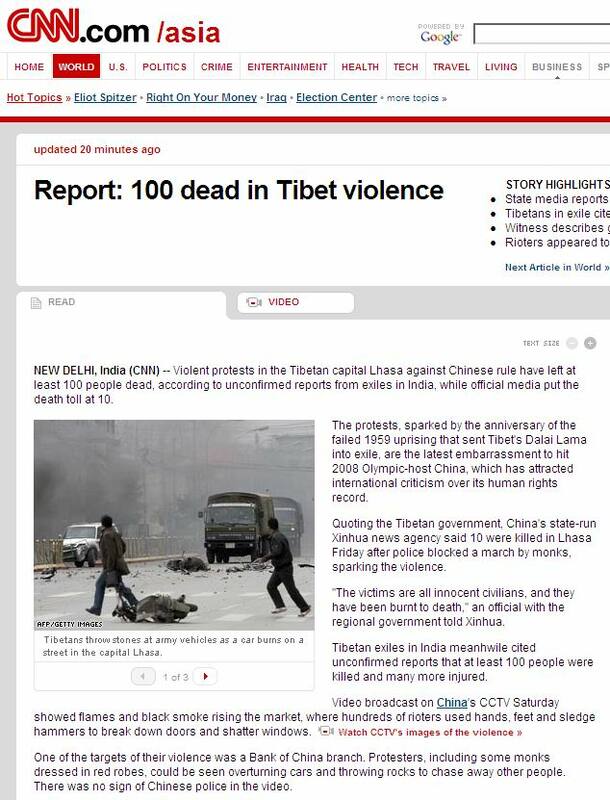 On 163.com and the web forum of people.com, more anger was poured against the mobs in Tibet. Blogger “Nature” from Inner Mongolia pointed that the series of conspiracy is meant to endanger the unification of China. Why do those rebels rise up at this point? It happened because Taiwan is going to make referendum in March, and if it was passed, Taiwan would then be independent. Tibetans are answering the call of Taiwan! What would it be if Taiwan was independent? It would give U.S another military base in Asia, a base on which they can reach us. That tells the complete story. Martial law in Lhasa, Hijack in Xinjiang, Taiwan election, anti-China force abroad, confusion made by foreign media, and boycott of Olympics! Chinese run into the harshest challenge of the century! Chinese, are you ready for 2008? 1. How tragic the snowstorm in China was! The heroes going home and soldiers keeping orders both showed the goodness and purity rooted in the nature of Chinese. But looking at the western media, I found no positive report, not mentioning sympathy. They cut and patched up scenes and quotes of interviewees, to make an all-in effort on fake stories about unrest in railway stations, violent crackdown and callosity of the government. 2. We don’t want to politicize the Olympics! But firstly a famous director dropped out due to human right issue, and then a singer called out “free Tibet” in Shanghai. Obviously she’s a silly singer, but the foreign media nevertheless boasted her up as an international fighter! We are trapped by the western countries. U.S firstly put us out of the list of human right violators and praised our progress, and then in 48 hours they reported the unrest in Tibet! It’s a mean plot to first drive the attention upon China and then threw us into a gaffe. It is obviously a disruption caused by the mob that unsettled the community, committed robbery and hurt police. Why most of western media only mentioned that our police beat citizens? They made the traitors heroes while the police that protected people robbers. And they purposely put on distorted pictures to trick the western that our police bullied people. Is this the objectivity and freedom of western media? I am sorry not to mention the blogger’s name, because at my second time to his blog the article had been removed. I then found it copied by another blog and there it came. Though people still speculate Beijing is taking the chance to trigger and canal a new tide of patriotism to fight against its enemies, judged from the information survived the censorship, the mainstream opinion is now bearing enmity against those sprung the insurgence. In Tianya.com and the largest military forum in China, Tiexue forum, few posts about Tibet could be found, letting alone the Xinhua forum that has an official background. There were occasional complaints from bloggers who grumbled about their censored posts. It’s like having no comment policy. Delete what doesn’t make you look good or you just don’t like that day. China is just doing what this blog does everyday. There really is little difference in the end. These types of people should never have power over others or it’s just like China and Tibet. These types of orgs are usually raided for their cash or sold out in countires where they ask for money to monitor. Petition to Chinese President Hu Jintao – for peaceful solution of crisis. This is a fascinating post, thanks so much for finding and translating these blogs. Despite the veil of secrecy the Chinese government has had over the whole issue, there’s little to doubt or have mistrust over them in this instance. Even traditional Western media outlets seem to implicitly point the finger at the Tibetan protesters for the violence and chaos. here’s a more optimistic interpretation of the Tibet protests and the Internet. I’d be interested in your opinion.